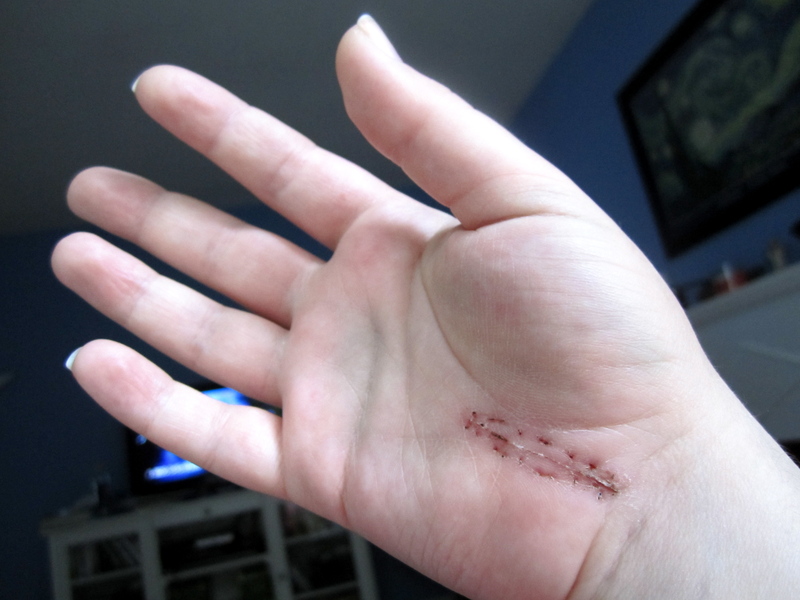 My stitches were removed today! I sound excited about this recent development, but the removal was pretty uncomfortable since my hand had become pretty attached to those blue threads on a cellular level. Still ugly, but certainly improving. Interestingly, my GP was surprised that I’m still so bruised and swollen two weeks after surgery. I’ve always been a slow healer, so I’m not shocked that this is a lengthy process for me. Hopefully physiotherapy helps me get on track. The good news that I’m able to accomplish a bit more now that my sutures aren’t catching in everything and pulling painfully. Unfortunately, I stuck my contacts in (with my left hand) yesterday, and I still haven’t been able to dig them back out. My left hand is too awkward at the angle I need, and my stupid right hand is way, way too clumsy to be flailing about on my eyeball. My eyes are starting to click when I blink. I now sound like I have a turn signal: awesome.